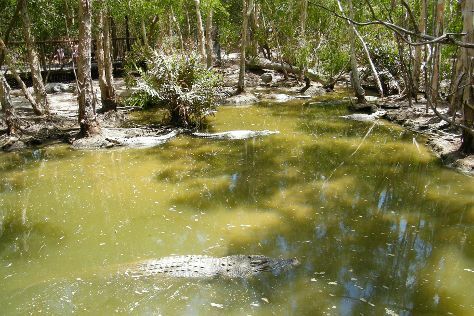 You'll visit kid-friendly attractions like Hartley's Crocodile Adventures and Palm Cove Beach. Venture out of the city with trips to Crystal Cascades (in Redlynch), Australian Butterfly Sanctuary (in Kuranda) and Sugarworld Waterpark (in Edmonton). There's much more to do: kick back and relax at Trinity Beach, soothe aching muscles at some of the top local wellness centers, get into the urban bustle at Tanks Arts Centre, and don't miss a visit to Henry Ross Lookout. To see ratings, where to stay, traveler tips, and tourist information, refer to the Palm Cove trip planning website . Sydney to Palm Cove is an approximately 6-hour combination of flight and shuttle. You can also drive; or do a combination of train and bus. Traveling from Sydney in January, things will get somewhat warmer in Palm Cove: highs are around 37°C and lows about 28°C. Wrap up your sightseeing on the 11th (Fri) early enough to drive to Port Douglas. Bring the kids along to Scuba & Snorkeling and Wildlife Habitat Port Douglas. Spend the 13th (Sun) spotting exotic species with a safari tour. There's more to do: enjoy the sand and surf at Four Mile Beach and look for all kinds of wild species at Mossman Gorge. For reviews, maps, and tourist information, you can read our Port Douglas itinerary planner . Traveling by car from Palm Cove to Port Douglas takes an hour. Alternatively, you can take a shuttle. In January in Port Douglas, expect temperatures between 37°C during the day and 28°C at night. Wrap up your sightseeing on the 14th (Mon) early enough to travel to Fitzroy Island. Kick off your visit on the 15th (Tue): explore the striking landscape of Fitzroy Island National Park. To find reviews, more things to do, and other tourist information, read Fitzroy Island sightseeing app . Use the Route module to find suitable travel options from Port Douglas to Fitzroy Island. In January, daily temperatures in Fitzroy Island can reach 37°C, while at night they dip to 28°C. Wrap up your sightseeing on the 15th (Tue) to allow time to travel back home.